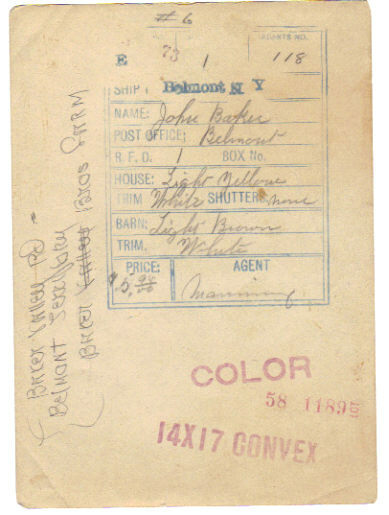 The photo above was received from Charles Baker, a grand nephew of the Baker Brothers of Belmont area. 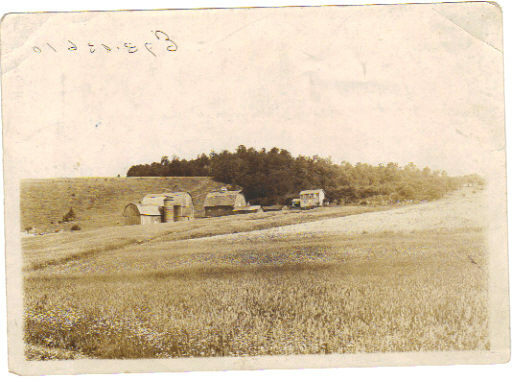 His note: "I have enclosed a picture showing the Baker Bros. Farm and another which gives the info on the back of the first photo. I would like to gather as much information as possible about the farm and the Baker Bros., ( John and Steven). They would be my great, great uncles. Do the buildings still exist?" This farm was reportedly on the Baker Valley Road, Amity. Any information can be forwarded to CHARLES BAKER (cherrylane932@aol.com) with copy to: Ron Taylor, Webmaster. Many thanks to Bob Dorsey of Stannards, NY (formerly Historian, Town of Angelica) for sharing this old photo. Fred Weeks was born 10/24/1864 at Franklinville, NY. He is shown on the 1900 census living with wife and two children at West Almond, NY (probably then addressed Bennets, NY). 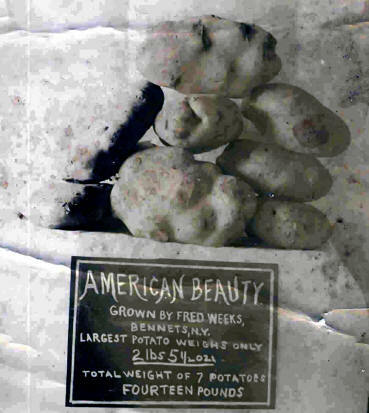 These potatoes were grown and apparently displayed at the Allegany County Fair, unknown year. The photo is shown to prove that Allegany County can produce not only the finest, but, sometimes the biggest! !